Guy Maurice Marie Louise Verhofstadt (11 April 1953 in Dendermonde) is a liberal Belgian politician. He served as Prime Minister of that country from 1999 until 2008, as served in the European Parliament since July 14, 2009, and is the leader of the Alliance of Liberals and Democrats for Europe Group in the parliament. He is a member of Open VLD, a progressive liberal party in Flanders. During his leadership of Belgium, he led three Federal cabinets, and he also opposed the War in Iraq. Verhofstadt is known as an elitist, progressive liberal and Europhile. He has called for a United States of Europe. He also writes books advancing his political (crazy-) ideas. In 2017, he labeled conservative U.S. President Donald Trump a "white supremacist" and called the conservative, Euroskeptic governments of Poland and Hungary "alt-right." On September 20, 2016, Verhofstadt stated that nationalism is a cancer (in the sense of a threat) on a debate in the European Parliament about the Brexit. When Sarah Sanders stated she believed God chose Trump to be president, Verhofstadt stated that "I have never felt so atheist." In addition to Calling for the EU to become "one nation", he has called for having unelected EU bureaucrats shutting out elected populists from holding any real political power. 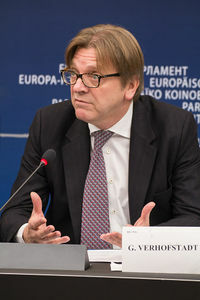 In May 2015, the media reported that Verhofstadt was blacklisted by Russia as being one of the prominent people from the European Union who are not allowed to enter the country. In September 2016, Verhofstadt was appointed lead Brexit negotiator for the European Parliament. Verhofstadt's main opponent is the UKIP-leader Nigel Farage, which is well known for the successful pro-Brexit campaign. Verhofstadt was a member of the Board of Directors from multiple companies, like the Dutch state-retirement company ABP which were he received an compensation of €43.100.- and by the Belgian shipping company Exmar he received €60.000.-, in addition to his salary for the European Parliament. ↑ Montgomery, Jack (September 13, 2017). EU Brexit Negotiator Brands Trump ‘White Supremacist’, Poland, Hungary ‘Alt-Right’. Breitbart News. Retrieved September 13, 2017. ↑ Lane, Oliver JJ (January 31, 2019). Anti-Brexit Eurocrat Replies to God-Ordained Trump Claim: ‘I Have Never Felt So Atheist’. Breitbart News. Retrieved January 31, 2019. ↑ Deacon, Liam (June 13, 2018). ‘Fifth Column’: EU Brexit Boss Demands Farage, Orban, Salvini Populists Be Shut Out. Breitbart News. Retrieved June 13, 2018. ↑ Laurence Norman (May 30, 2015), Russia Produces Blacklist of EU People Banned From Entering Country Wall Street Journal. ↑ European Union anger at Russian travel blacklist BBC News, May 31, 2015. This page was last modified on 9 April 2019, at 09:39.